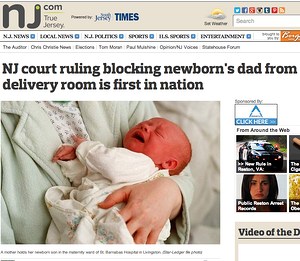 In a scene as dramatic as any in reality television, New Jersey mother Rebecca DeLuccia testified from the delivery room that the father of her child should not be allowed to attend the birth of his child. She testified via phone before Superior Court Judge Sohail Mohammed who issued a ruling barring the father, Joseph Plotnick, from the delivery room. Plotnick had sued--after DeLuccia went into labor--to attend the delivery. DeLuccia wanted no part of that. Plotnick argued that he had a right to bond with his child from the moment of the child's birth. Judge Mohammed didn't agree, although he acknowledged Plotnick's desire was "laudable." In explaining his decision, Judge Mohammed said that the attendance of Plotnick would "invade [Rebecca's] sphere of privacy and force the mother to provide details of her medical condition to a person she does not desire to share that information with." As you might imagine, reactions to the ruling have been mixed. Some reactions have been passionate in defense of the mother's or father's rights. What I found interesting, however, is not what was said about the rights of the parents but was not said. No one asked the most important question: Why did this situation arise in the first place? It arose because DeLuccia and Plotnick conceived a child before they were committed to each other. They had been engaged to be married after they learned of her pregnancy, but then they decided to break it off with very little contact between them leading up to the birth. Apparently, they didn't like each other much. And it's likely they were ignorant about the fact that the most significant predictor of whether a father is involved in the life of his child is whether he's married to the mother. No one wants to ask the really tough questions about why we've reached the point where nearly half of all births are to unwed parents. We have to challenge men and women to take responsibility for and think through their actions before they have children, not after. This challenge must start when men and women are still children and continue unabated until their behavior reflects that they understand the consequences of having children before they're committed to a life in which they raise their children in the same home as they other parent. What are practitioners and programs that serve unwed fathers supposed to do about this issue? They might think they have no role in addressing it because they engage these fathers after the fact, so there isn't a need to issue this challenge. I disagree. One of the most significant challenges I hear from practitioners and programs is how difficult it is to work with fathers who have children by multiple mothers. How are they supposed to get fathers involved with all of their children? Do they have to "pick and choose" which children to become involved with? These are incredibly valid and troubling questions. The reason to issue this challenge--to help fathers understand how their behavior put them in their situation--is that it's vital to preventing them from continuing to engage in that behavior. It's never too late to help fathers connect the dots. Is your organization "father friendly"?